Jezebel and Michelle In the snow! It doesn’t snow a lot out here but it does snow. Certainly more then my Southern California born and raised self is used to. 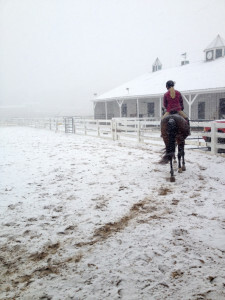 This is also the first winter I’ve had horses out here when I don’t have an indoor ring to ride in. Lets just say I’ve invested in some better cold weather horse gear and clothes. Blizzard boots, under armor, a awesome cold weather jack from REI (on sale.. score!) 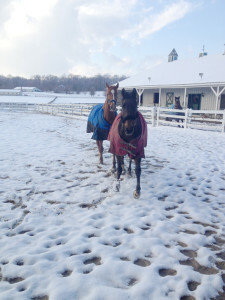 and for the ponies, quarter sheets and warmer blankets. We are as prepared as we can be this year. For the last few days we’ve had some on and off again snow. 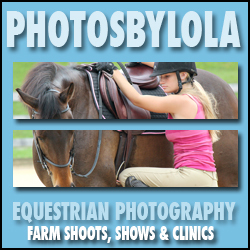 Sunday is our regular day with our trainer she usually rides both girls and teaches them a thing or two Both are coming along really nicely. 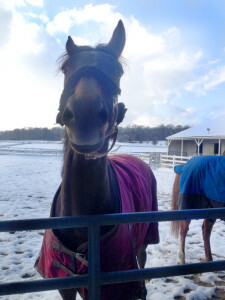 We decided since the snow was light to brave the weather and my trainer made the track to the barn. Of course just as she drove on to the property the snow really started to fall. I had Jez all tacked up for her and ready to go, go, go! 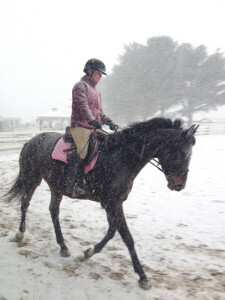 Michelle took Jezebel out for her lesson and Jez’s first ride in the snow. She did great, I mean amazingly great. She actually seemed to like being covered in cold wet snow. Good thing cuz it really started to come down in the middle of the ride. Jez was comfortable enough to even give her trainer trouble about throwing her shoulder out and put in a few bucks for good measure. My trainer wasn’t phased with her antics and rode though it until Jez decided to comply and hold her body right. She even picked up both her leads… correctly and on the first try. Woot! I was so proud of my girl I could barely contain my happiness. The snow really started in earnest as a result we decided that one was enough and that Circe’s ride would have to be moved to another day. The ground was hard and I like to take it easy on her newly bare feet. I did buy her some Easy Care Glove boots that will hopefully be here soon. I think they will help make a difference with the redhead on the harder surfaces. I love her goofy smile!